5 Hellenic American politicians of have been voted into to the United States House of Representatives following the midterm elections on Tuesday. Moreover, a veteran with knowledge of Greek and Cypriot affairs, was reelected in New Jersey. Greek-American Democrat John Sarbanes retained his seat in Maryland’s 3rd congressional District, scoring a comfortable victory of 68.6% over his Republican rival Charles Anthony. Republican Representative Gus Bilirakis, the cochair of the Hellenic Caucus who represents Florida’s 12th District, earned a 7th term with 58.1% in the House after defeating Democrat Chris Hunter. In Nevada’s 1st congressional district, Dina Titus was re-elected to a 4th term, cruising to victory with 66.2% over her Republican opponent Joyce Bentley. 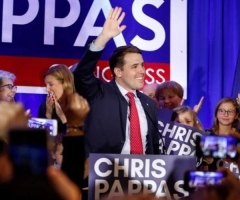 Democrat Chris Pappas beat Republican Eddie Edwards with 53.6% of the vote in the race for New Hampshire’s 1st District, becoming its first openly gay congressman. Michael Waltz, a former Green Beret commander with Greek roots, beat Democrat Nancy Soderberg with 56.3% in the race for Florida’s 6th District, while in Wisconsin, Republican Leah Papachristou Vukmir, a staunch supporter of President Donald Trump, lost to Democratic Senator Tammy Baldwin. Democratic Senator Bob Menendez of New Jersey, widely seen as an ally of Greece and Cyprus for over 2 decades, was re-elected to a 3rd term in with 53.1% of the vote, defeating Republican Bob Hugin, an ex-pharmaceutical executive. At a local level, Eleni Kounalakis will be the first female Lieutenant Governor in California, garnering almost 57% of the vote. She replaces Gavin Newsom, who was elected Governor.